It’s chest and triceps time with Jed Hodge, who has another video that might help you fix a few minor things in your chest training. Specifically, two things most of us aren’t so great at: Working the upper chest and the lower tricep. 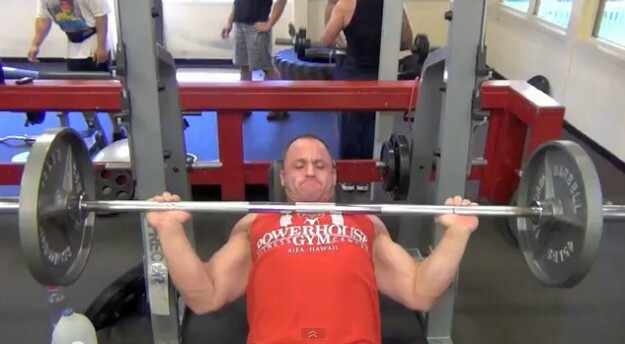 Incline bench (or any pressing exercise) — Tuck the elbows in and don’t go wide out. This will help spare your shoulders. Pushing back up at an arc works the upper chest, which many of us (myself included) are missing. For flat bench, DB presses are safer on the shoulders than barbell. Some of you young guys might not feel it, but at some point in everyone’s lifting career, flat bench ends up causing some kind of problem. Anyway, Jed hits the DB press at a ~45 degree angle in the video at around 1:25 – something to try. He also focuses on a slower negative and goes for more explosive movement on the way up. Incline Dumbbell Flys – Jed uses two different variations, two sets each. In the first variation, he uses a steeper incline, but arches the back so that the chest is “flat” to the ceiling. Way more upper chest work here. In the second variation, he does a “wide press” (extending his arms out in a bit of a “V” shape), and then squeezes together. See this at around 2:50. This hits the collarbone area more. 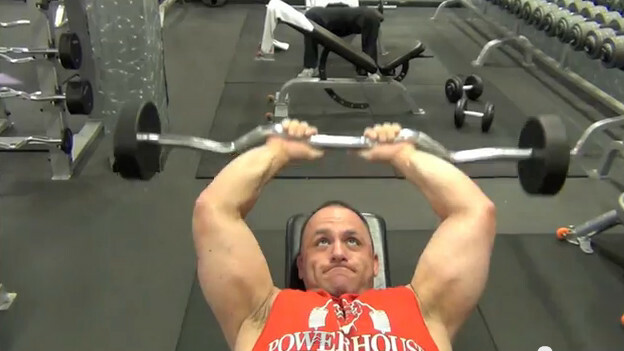 Incline Hammer Presses – If you have this machine in your gym, USE IT! There’s tons of stuff you can do here. For Jed, he uses this to “rep out”, 3 sets of 20 reps or so, hitting some extra bonus movement for the upper chest. What good is chest day without hittin some triceps? EZ Bar Extensions for the inner tricep. This looks awesome and is where many of us (myself being the worst) are terrible. This has to go into the arsenal for a while if you’re feeling weak around the “elbow joint” area. Back to the rope extensions – Jed twists it out for extra feels on the outside tri. Jed finishes off with incline skull crushers. Notice his upper arm positioning and grip with the thumbs. These small details make a huge difference for him. In the movement, the bar goes behind his head and not on top of it. One thing you’ll notice in a lot of these exercises is that Jed does extra stuff to keep a higher amount of time under tension. The negatives on DB presses. The extra “twist out” on his tricep pushdowns. The skull crusher movement. When you’re going for the “look” of a big guy like Jed, these things are huge, and when we’re just “going through the motions” in the weightroom, we often forget about these little extras. It’s that last 5-10% that makes the big difference, and that’s why it’s a great idea to get a competent personal trainer when starting off or in a rut. You can also see Jed’s Wider Back Workout Here. No Comments | Posted in Bodybuilding, Weight Lifting, Workout Videos | Tagged Chest Workouts, Jed Hodge, Tricep Exercises.